Transitioning to a new school can be a difficult experience for a young child. From preparation to integration, here are some tips for parents and guardians to make your child’s first day at a new school a little smoother. Initiate a conversation with your child about the new transition. Ask questions, listen to their answers and respond in a positive manner. Keep in mind that how you approach your conversation about their new school will shape how they view the transition. Need an easy way to approach your child? Reading a book where the characters are going through a similar experience can be a great conversation starter. Curious George Goes to School by Margret Rey and The Berenstain Bears Go to School by Jan and Stan Berenstain are possible options. As you get closer to the big first day, keep communication open and positive. Allow your child to express any fears or anxieties, but also help them think about reasons to be excited. The more information your child has about their new school before walking in on the first day, the more comfortable the child will feel. If possible, visit the school and take a tour of important spaces like classrooms and the cafeteria. Meeting teachers and personnel will make the first day easier, according to Parents.com, as the child will be able to recognize familiar faces. At minimum, drive by or look at pictures of the school. The more visualization your child can do prior to the first day, the easier it will be for the child to make positive associations about their new environment. Making connections can help a child integrate himself or herself into their new learning environment. Encouraging your child to join a sports team or participate in a club can give them an extra opportunity to make friends. Help them continue to nurture new friendships by planning play dates so they can spend time with their friends outside of school. At school or at home, your child may not act like their normal self right away. Remember that they are reacting to a new environment and he or she will need time to adjust. Their mood, sleeping patterns or diet could change temporarily due to the new transition. Be patient and comforting as your child navigates the new experience and be available and present if they need some extra TLC. 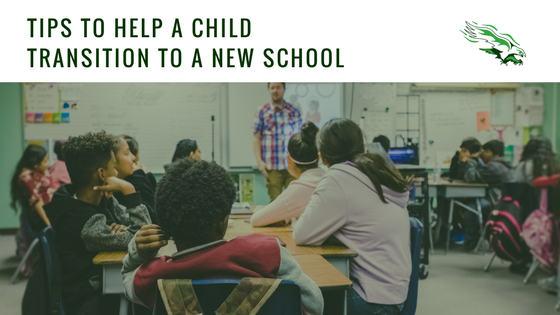 Transitioning to a new school can be a daunting experience for a child, but having the support of their parents and guardians can make the process a lot easier as they find their place in their new environment.